-- and the saxophone, invented by the prolific Adolphe Sax, in Paris, in the 1840s. At a casual glance a modern clarinet or saxophone look like rather complicated objects, they are bristling with keys and rods and feature various carefully interlinked and engineered gizmos; and as for the mechanism hidden between your piano key and its string(s), that is even more ingenious, in fact a quite stunning achievement for one person to have developed alone. However, I feel strongly that these three instruments have been so successful in subsequent musical history because they are conceptually -- and acoustically -- very simple. A clarinet is what you get when you couple a simple tone-generator (single-reed and mouthpiece) with a cylindrical pipe; a saxophone is what you get when you couple the same with a conical pipe; and a piano is a set of strings that come provided with bionic fingers to strike, strum, or caress them (as opposed to a harpsichord, which can only pluck). However a concept does not actually make an instrument. Denner and his successors had a lot of tinkering to do to before the clarinet was a fully balanced instrument, effective in both registers; and Cristofori's early pianos probably sounded very mute and characterless beside a brilliant harpsichord, so that the full piano-ness of the piano became incontrovertible only as the instrument got beefed up. Technical issues are only half the picture; because an emerging instrument also needs a musical community for which its existence makes sense. The piano had a headstart, as all of Europe was pretty well-stocked with people, professionals and amateurs, who played keyboard instruments; the clarinet put a startling new sound into the hands of the smaller though still sizeable community of wind players; and the saxophone was specifically developed, it seems, for the definite purpose of enhancing military bands, and was promptly appointed to that very task. So these three products of genius were born into a fairly warm and welcoming environment; and were accepted fairly swiftly -- which is to say, it took each of them between fifty and a hundred years to become properly developed and established. That's swift, in historical-musical time. If this is a pattern -- let's assume it is -- then the arrival of the marimba fits it very satisfactorily. The marimba has no equivalent figure to Denner or Cristofori, because of course the basic musical concept did not have to be thought up by an originator of genius; marimba-like instruments are absurdly widespread throughout the pre-modern world, so that one might even take for granted the arrival of such instruments in any human society that possessed 1) a musical culture, and 2) trees. Perhaps this is just another way of saying that there was an originator, but history never recorded who it was. 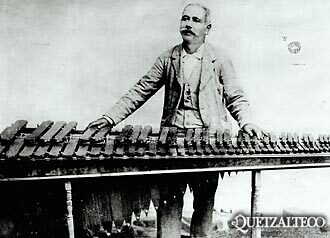 If any one personality was responsible for making the modern concert marimba possible, it was Sebastian Hurtado of Guatemala. In Guatemala the pre-modern marimba had undergone various kinds of fancification and was the centre of a thriving musical practice but it was Hurtado who, at the suggestion of the composer Julian Paniagua, added a row of sharps and flats to the hitherto diatonic instrument. Recall a phrase from the biographical note on J C Deagan -- he developed [the marimba] from a novelty from the jungle into an accepted musical instrument -- which is, to put it politely, a rather Yanqui point of view. Hurtado and Paniagua were not unsophisticated forest dwellers, but urban (and urbane?) musicians who I suspect knew perfectly well what they were doing -- making the marimba suitable not only for folk and popular music but turning it into a plausible participant in "art" music and the music -- whatever it might turn out to be -- of the future, of the twentieth century. Standard practice for a Guatemalan marimba band is to have (at least) two marimbas, one tending to the treble end of things and one to the bass, each with two, three or four players standing elbow to elbow; today a bass and drums are commonly required, with optional guest soloists on saxophone, cornet, etc. 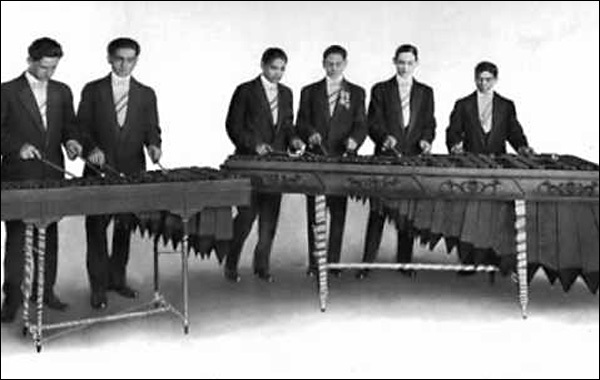 A band of Hurtado's relatives (The Hurtado Brothers Royal Marimba Band) began touring abroad about 1908 and brought musical civilisation to the jungle of the US shortly after, recording many sides for the Victor company in 1915 and 1916. And they were just one of several central american marimba ensembles that toured, recorded, and in some cases settled permanently in El Norte. But the early US instruments, though possibly more uniform and reliable than what you'd have found in Quetzaltenango, were no real advance on Hurtado's work. The next step forward was not made until the introduction of harmonic tuning, which is a subject for the next post. A closer look at that banknote. 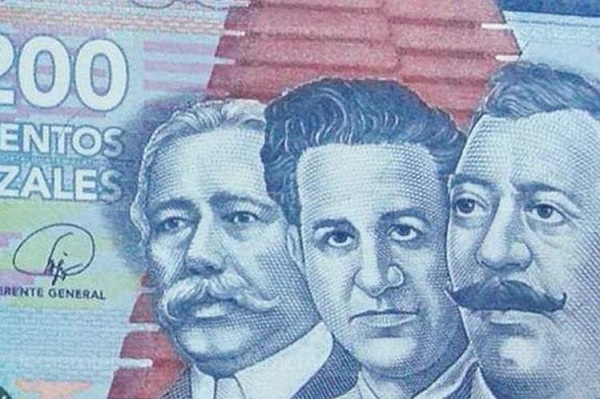 Sebastian Hurtado (1827 - 1913) is on the left. The others are the musicians German Alcantara and Mariano Valverde. Read about them here (in Spanish, naturally).